Favorite food: Anything within reach, and I have tremendous reach! Favorite toy: Tiger kong, squeaky shoe, mom's socks. Favorite activity: Zooming, nibbling on toes, barking at anyone walking by on MY street (yeah, it's mine). Special talents: Can leap over tall things in a single bound (I have long legs). 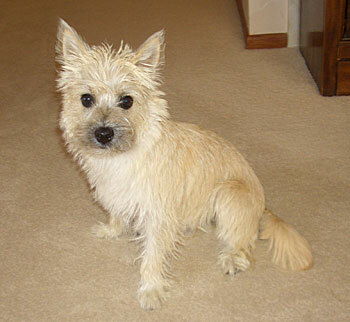 Most embarrassing moment: I don't get embarrassed, I'm a Cairn. Mom and dad are the ones who get embarrassed. Most trouble I ever got into: Pulling up carpet fibers, shredding draperies, and unravelling TP rolls to my heart's content. My favorite friends: Everyone who meets me. Biggest adventure: Sniffing every nook and cranny in my new home.